"Like super-crazy Big Brother, but it's happening"
As with many documentaries about American politics, this one's core analysis is clear within the first 35 minutes (there are many specific details and ramifications to follow). The process outlined by investigative journalist John Adams, one of the film's pivot persons, is simple. A corporation (or it could be simply a very wealthy individual) gives money to a "PAC" ("political action committee") to raise and spend money to elect or defeat candidates. It's essentially a money laundering system. The PAC pays for publicity, while concealing the identity of the donor. The "dark money"-funded campaign is then free to utter utterly false claims, which it's too late and too expensive to reply to. The forces that favor this process oppose all disclosure, all spending limits, all truth in advertising - all regulation around the publicity that defeats or elects a candidate. The elected candidate then supports the corporation. It's a circle. "So then it's not the people controlling the government," says Adams, "it's the government controlled by a corporation controlling the people. . . which is like super-crazy Big Brother, but it's happening. To me that's what this is all about." And that's what Reed's Dark Money is all about: how a new freedom for elections to be entirely controlled by money is allowed by the "Citizens United" Supreme Court decision of January 21, 2010 permits elections to be entirely controlled by big money, with no transparency. What makes Kimberly Reed's film particularly neat is the way she focuses on her home state of Montana, because Montana is the "frontline" of the fight to save fair elections. After "Citizens United," of the 22 states with their own campaign funding laws prohibiting unlimited spending from dark money on elections, all caved (without explanation) but Montana. So that state with its small population and rich resources a site for corporate exploration notable in the mining business, indeed became a battleground for this issue - an issue on which the survival of American democracy depends. Reviewers have called the film "dense," and it is dense with people and specificity, focusing on a string of specific lawmakers who have played specific roles, have been attacked by dark money in elections, exposed the open pit copper mines of Anaconda Copper Company. Or have fought the unnecessary capitulation of the states to the federal-related "Citizens United" decision, or, like John Adams, have been following this process. Adams was a young investigative journalist from Wisconsin who worked for the Great Falls Tribune (later closed). You can follow Adams on Twitter at MTFreePress or @JSALowdown. Adams lost his job at the paper and was reduced to living out of his 4x4 with his lab, but shaved off his mustache and started a non-profit news outlet, The Montana Free Press, fielding articles all over the state. Four fifths of the way through, after being a lecture on campaign finance improprieties, then a story about a struggling young journalist, finally becomes a courtroom drama, following the corruption case in the Montana Supreme Court against Montana legislator Art Wittich, who let his election campaign be financed and orchestrated by a raft of interlocked organizations without disclosing that he did so, which is illegal. He could hardly win. He was blatantly controlled by money from the far right. Retired Supreme Court Justice Gene Jarussi had taken on the case and spent thousands of hours researching it. He had the goods on Wittich. The jury found Wittich guilty, he got a hefty fine, and voters voted him out. This film relates to and in some ways overlaps Jane Mayer's 2016 Dark Money. Maayer's book focuses onthe Koch brothers, Kansans who are ultra-rich from oil. After the rise to power of conservatives brought in by Reagan's election in 1980, the Koch brothers began their own slow rise to political power by buying elections, one by one, all over the United States. A major step forward for them came in 2010 when right-wing anti-government Republicans began to control the country - state legislatures, governorships; one chamber of Congress, soon to be followed by the other. The Koch brothers have their fingers in every pie, including Montana. It's chilling to see how as the film also points out, the Koch brothers are working toward the last step of taking over a country - gaining control of state courts. 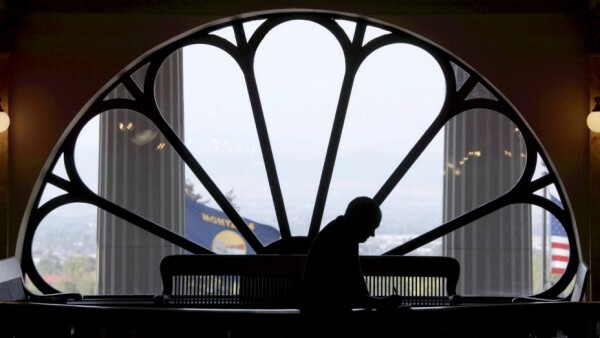 Dark money has got the presidency, the film suggests; it owns the Congress, and it pretty much has the Supreme Court. State courts are the last step, together with infiltrating, undercover, of course, the universities. It doesn't control the press - but the press is disintegrating in favor of a totally commercialized television and the Internet. Except for brave and independent journalists like John Adams. Dark Money, 99 mins. was directed and produced by Kimberly Reed (Prodigal Sons; she is the first commercially-released transgender filmmaker). Also produced by Katy Chevigny-IMDb. It debuted at Sundance (nominated for the Grand Jury Prize) Jan. 2018 and showed at a handful of other US festivals, garnering a win and various nominations. It has been acquired by PBS, which is releasing it theatrically Friday, July 13, 2018.